Solution One is a comprehensive Roof Inspection and Maintenance Program available through Roofing Solutions LLC designed to help you get the most out of your current roofing system while managing the cost of your building's roof going forward. The program is designed for facility managers, property owners, and management companies that want control over their roofing expenditures, want to optimize the life of their current roofs, and want to be able to have someone they know they trust in the event of a roof problem. Typically, the yearly fee for a semi-annual program is between 1-3% of replacement cost. This is true across a majority of the industry. Our program, Solution One, is based off a proprietary pricing model with additional accommodations within the formula that allow us to provide incredibly competitive rates to our customers. Initial Assessment of your existing roof and its history. Information that is gathered by a thorough examination of the roof as well as all information that you can provide regarding its maintenance and repair are used to create a maintenance and repair program that is based upon the exact condition of your specific roof as well as your goals in extending its useful life. Scheduled Cleaning of the roof which includes the removal of accumulated seasonal and neighborhood debris from the field of the roof, around the drains, and around all roof-top units and vents. Keeping your roof draining freely is one of the single most important items in extending its service life. Scheduled Inspection and Photo Documentation to ensure that the plan that was developed for your specific roof is being followed. 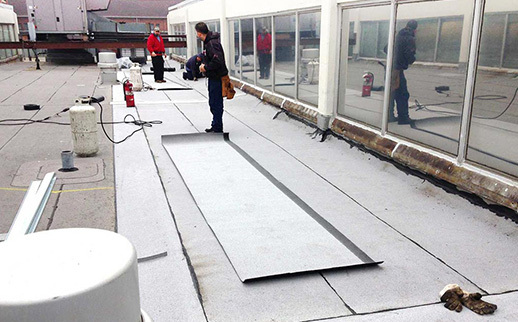 Repairs as needed to address typical items critical to the roofing system's integrity before they can develop into more costly problems and cut short the remaining service life of the roof system. 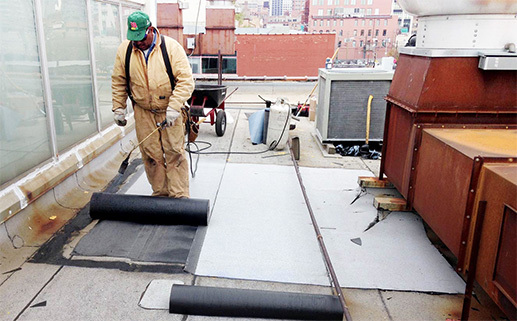 Typical repair items include flashing repairs (or new flashings) at roof drains, plumbing vents, roof-top units, pipe feeds and other roof projections as well as field maintenance including seam failures, blistering, ridging, wind scouring and surface / coating erosion. 24-Hour Emergency Service in the event of damage to the roof due to severe weather or other extraordinary event. Objective Industry Based Planning and Guidance so that you will know what your options will be long before it is time to replace or retrofit your existing roof.